This is an awfully delicious dish, especially when eaten hot. Yummy! 1. Mix sotong and shrimp meat together with bamboo shoots/water chestnut, spring onions, red chilli and coriander leaves. Season with fish sauce and pepper. Divide into 8 portion and shape into individual patties. 2. Dust patties with flour, dip in beaten eggs and coat with breadcrumbs. Deep frying in preheated oil till golden brown. 3. Combine sauce ingredients. Serve patties with sauce and garnishes. 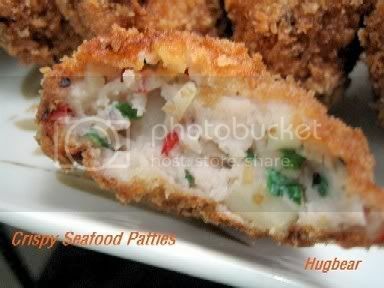 * If using squid, the patties texture will be very soft. Cuttlefish (Mak Tao pronounced in Teochew) has a tougher texture which is better for this dish. 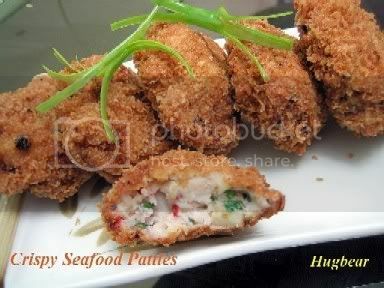 Hi leelee, yr seafood patties look sooo delicious. is it posible to share yr recipe..tq in advances..rgds fila. Sure, will post the recipe up shortly. Hi Leelee, thanks for sharing. 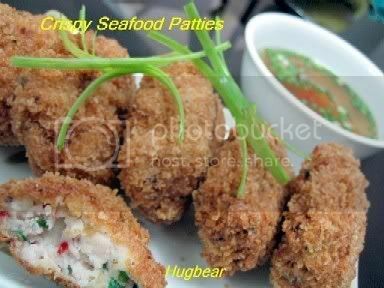 Your seasfood patties look very yummy. No, not brown sotong. It broader than the normal white sotong, meat is harder also. In Chinese it's call 墨鱼. Hi anonymous, what are you exactly looking for? What kind of recipe?